One of my kids’ favorite things to shop for during back to school season is a new lunch box. Well making their lunches fun too is a great way to keep them from trading it for somebody else’s goodies. These fabulous lunch box ideas are fun, delicious and healthy at the same time, plus they’re easy to put together and your kiddos are sure to love them! Peanut butter and jelly sandwiches are a classic lunch box staple but these cute PB&J Chick Rollups from Bentology are a beautiful way to present an old favorite. Use a theme for your kids’ lunch boxes or give old favorites new names like this Lady Bug Pasta Salad from Momables that features black olives and cherry tomatoes. A new twist on a peanut butter and banana sandwich, these Banana Dog Bites from Weelicious are fast and easy to make and will please even the pickiest eaters. Something as simple as using novel ingredients instead of bread, like these Waffle Sandwiches from Huffington Post, will keep your kids lunches from becoming boring and monotonous. Using refrigerated pizza dough makes these Pizza Muffins from Really From Pinterest super fast and easy to make. They’re also very portable and a batch is enough for a couple of kids. This photo gallery of adorable lunch box figures from Boing Boing includes a Goofy Sandwich, a Swiss cheese Sponge Bob, Snoopy, Angry Birds and bunch more characters to entertain your kiddos. 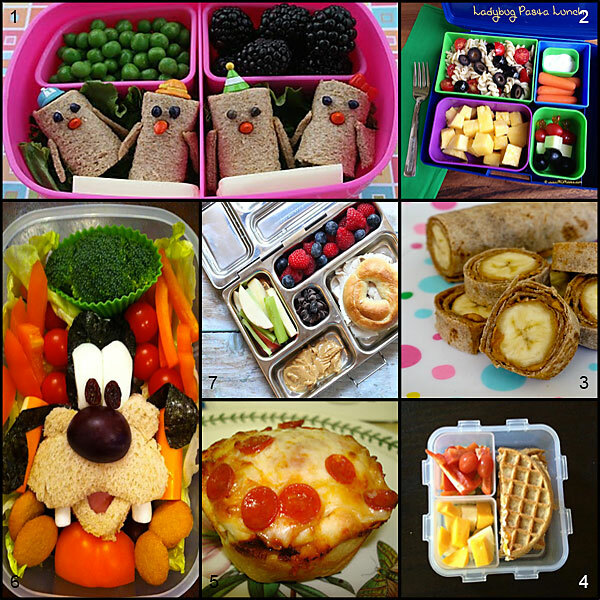 The Organic Kitchen shares several healthy lunch box ideas as well as creative ways to use leftovers. The variety presented will keep your kids happy and you’ll be pleased to know they’re eating a lunch that’s both healthy and delicious. I highly recommend Plan to Eat for a great place to store all your favorite recipes! Check it out with a free trial and see how easy it is to add recipes from the Internet, plan meals for your family and even print out a handy grocery list. 1) Stock up on reusable containers. Invest in reusable containers and in quality lunch boxes or bags instead of spending money on disposable containers and plastic bags. You’ll save a whole lot of money in the long run. Spend a little to purchase quality reusable water bottles for beverages, too. They’ll come in handy for water, juice, milk, or whatever it is your children want to drink at school. 3) Purchase goods on sale. 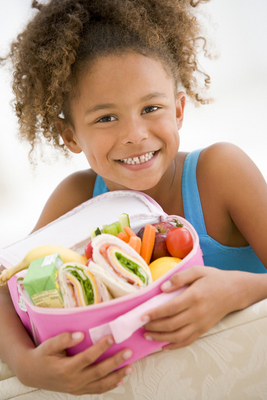 Check your local grocery store for sales on cookies, crackers, juice, and other lunch box staples. If prices are low on your child’s favorite snacks, then stock up on them for days that you’re running low on supplies at home. Save the extra napkins and packets of mustard and catsup from fast food restaurants and use them for your packed lunches. It may not seem like a big deal, but in the long run, you’ll save quite a bit on these little extras. 5) Stay away from single servings. Juice boxes and individual bags of chips may seem extremely convenient, and there’s nothing wrong with buying them occasionally. However, if you’re on a tight budget, it may be hard to ignore the difference in costs between the single-serve items and the larger ones. 6) Pre-package your snack items. Buy your cookies and chips in bulk and ask your kids to help repackage them in individual containers or bags at home over the weekend. Store them in a basket on the kitchen counter and you’re ready for the school week ahead. 7) Make your own goodies. If you’ve got some idle time over the weekend, make large batches of gelatin or pudding, place them in individual containers, refrigerate them, and pack some on days you’re almost out of food items. You can also try baking goodies such as brownies or cookies instead of buying them at the store. 1) Bring a packed lunch. 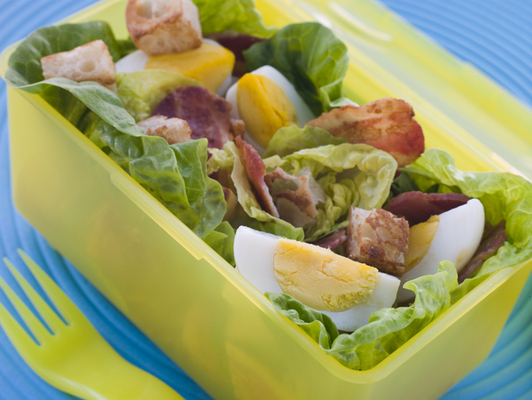 There’s absolutely nothing wrong with bringing a packed lunch from home. One of the simplest ways to do this is by setting aside a portion of the previous night’s dinner for your lunch the next day. You can also wake up a bit earlier each day to prepare a sandwich for you to eat later on. Bring up the idea of a weekly potluck lunch at the office with your co-workers. Everyone can bring one dish from home to be shared with everyone else. You’ll get a wider variety of homemade dishes and it won’t have to cost a thing. If the idea of a potluck lunch is a hit, you can do it more than once a week! 3) Pool your lunch money. Once in a while, treat yourself to some takeout food. Pool your lunch money with your co-workers, and then order some pizza, sub sandwiches or Chinese food to share. Splitting the food (and the bill) will allow you to enjoy the experience of dining out at a fraction of the cost. Is your workplace within walking or biking distance to your home? If so, head home and have lunch with the family. You’ll not only save on the cost of dining out, but you’ll also get a change of atmosphere, some fresh air and exercise, and will even save on gas money. 5) Store snacks at the office. Many nutritionists and diet plans suggest eating several small meals throughout the day instead of three larger ones. Store a few (healthy) snacks or meal bars in your drawer to help curb your appetite between breakfast and dinner. This way, you won’t be starving when lunchtime comes around, and you won’t overspend and you won’t eat more than you should. 6) Take a closer look at your budget. If packing lunches or eating at home aren’t an option, then at least take a closer look at your daily expenses. Set a reasonable lunch budget for the week and stick to it. With a strict lunch budget, you’ll find yourself stretching your money instead of spending it all on just one meal.